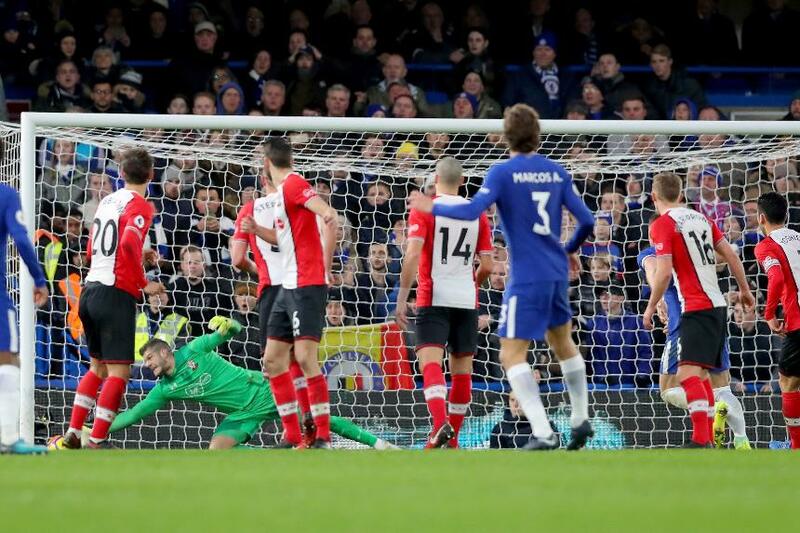 A Marcos Alonso strike gave Chelsea their second win of the week as they beat Southampton 1-0 at Stamford Bridge. In first-half stoppage time, Alonso curled his free-kick beyond Fraser Forster and into the bottom corner as Chelsea made their pressure count. Moments earlier, Pedro battled his way down the wing and cut inside, only to see his effort hit the foot of the post. Forster denied N'Golo Kante and Willian as Chelsea looked to increase their advantage, while Southampton twice came close through Charlie Austin. Chelsea are in third position, behind Manchester United on goal difference ahead of the Red Devils' visit to West Bromwich Albion on Sunday. Southampton are 12th with 18 points.